¡Hola everybody! I’ve kind of slacked on creating Spanish freebies. I’ve been totally stuck in math mode. 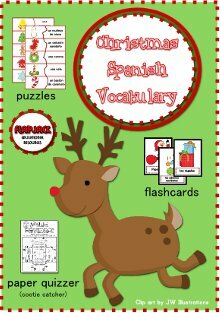 So, here’s a freebie to anyone who needs something cute and fun to practice Spanish vocabulary during the holiday season. ¡Espero que disfruten! Click here for a TpT download. Click here for a Currclick download. Did you hear about my Multiplication Paper Quizzers freebie? Click on the title and read the title description at TpT for details.